My Fav T.V. Shows Past and Present!!! A collection of viral videos from the internet, clips, and pranks. The impractical jokers go on tour and take you with them showing you all the best parts of the tour finishing in vegas. The Tenderloins travel across the Atlantic to the UK where they challenge each other in a pub, a fish and chip shop, and by the Thames. This has to be the best show on TruTV. It is probably the only show were you can look at people who are just as dumb as they are criminally minded. 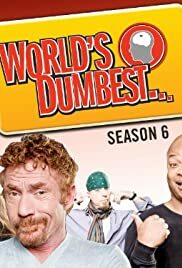 What really makes this show so good is the fact that they cast members who are notorious for doing some rather stupid things themselves (Danny Bonaduce, Tonya Harding and Leif Garrett) readily admit to their foibles as they constantly rip on the dumb criminals that constantly show up on the show. Also, the show doesn't just concentrate on criminals. They also show people who do stupid things such as fighting, partying and just general idiotic behavior. TruTV definitely has a winner with this show.